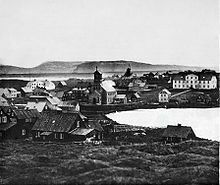 If your ancestors lived in Reykjavik or, more likely, visited there to trade, who would they have dealt with? Who were the people who decided what they’d be paid for their precious trade goods and what they’d paid for the supplies they needed to survive for a year? Richard Burton, 1874, gives a good picture of who made up the business establishment. Since the trading season was the summer when the weather was at its best, the traders would all be in Reykjavik but, not surprisingly, most of them left for Copenhagen as the trading season ended. From RB’s description, it sounds like the traders kept a good deal to themselves, making the best of this hardship post by having picnics at the Laxá River and by going riding in the countryside. The country folk, and since Reykjavik was little more than a small town, virtually everyone was country folk, might be working long days getting in the hay, taking care of animals, pounding dried fish, knitting, doing everything possible to see that there would be enough food to last through the coming winter, but the traders, as they picnicked, had no such concerns. Come the end of the season, they were heading back to Denmark and civilization. The storekeepers were called merchants (kaupmaðr). They were the big shots. They called the shots. Their establishments had no signs or names on them but had prime positions facing the sea. The people who worked in these stores were mostly hired help working for Copenhagen firms. They received fixed salaries rather than being on commissions. 2. 2. Hr Fischer, A Dane, married to an Icelandic wife, settled at Copenhagen, and occasionally visiting the island. He occupies the corner tenement to the right of the Bridge House and he has large stores fronting his shop. 3. Hr Havstein (Dane), who has not long been established; his private dwelling is attached to his store at the west end of Harbour Street, but he usually lives at Copenhagen. This house charters two or three ships a year to carry its goods. 4. 4. Hr Hannes Jónsson, an Icelander, son of the former Bishop Steingrimur Jónsson. His stock is furnished by Hr Jonsen of Copenhagen, who has also establishments at Hafnafjörð, Papós, and Seyðisfjörð. 6. Hr P.C.Knutzen, a Dane, whose agent is Hr Sviertsen. He trades on his own account, without a company and, being young and wealthy, he prefers Copenhagen to Rekjavik. At Hafnafjörð he has another establishment, and an agent(Hr Zimsen). 7. Hr Möller. The Club is held at his house. 8. Hr Schmidt (Danish), who hires a house at Reykjavik, and passes the winter at Copenhagen. He is consul for Holland. 9. Hr Th. A. Thomsen, a Dane of Flensburg, born in Iceland. He passes the winter at Copenhagen; and, besides being one of the principal traders, he is well-known for his civility and kindness to strangers. 10. Hr Edward Siemsen, at the east end of the town. He is agent for his brother and their nephew, and he also acts as Consul for Denmark. Only two of the traders are Icelandic, Egill Egillsson and Hannes Jónsson; however, Hannes is only an agent working for Jonsen of Copenhagen, a company large enough to not only have a trading post in Reykjavik but stores at Hafnafjörð, Papós, and Seyðisfjörð. The Icelanders weren’t bringing money. There was very little silver (rigs dollars or the occasional shilling). When they rode into Reykjavik with their pack train of horses, they were bringing “salt meat, beef, and mutton; tallow; butter, close packed; wool in the grease; skins of sheep, foxes, and seals; feathers, especially eider down; oil of whales, sharks and seals; fine and coarse jackets of Wadmal, woolen stockings, and mitts; stock-fish and sulfur. The major items they wanted in return for their goods were timber, mostly pine and fir, salt, coal, grain, coffee, spices, tobacco and liquor. They could get beams for roofing and framing, twenty-two to twenty-four feet long, one inch boards for side-lining of houses, three-inch planks, and finer woods” for the cabinet maker. They had to pay $2 for a 44 gallon barrel of salt. They had to have salt for the fishing season. The coal that was available came from Britain. There was a chronic lack of fuel but coal was both expensive and difficult to transport on horseback. Split birch stove wood was imported but it wasn’t available to the ordinary Icelander. The wheat and rye came as grain, flour and made into biscuits. Baking ovens, RB says, only exist in Reykjavik. Grain being taken into the countryside would be made as loaves cooked in the ground or as flat bread. An oven would take too much fuel. Rice had become a staple commodity and was used for making rice-milk. A number of travelers from around this time mention being served rice milk. There were luxuries. Cinnamon, pepper, cloves and nutmeg were available. Coffee was available but tea was very rare. A little chocolate, RB says, was brought from Copenhagen. Large amounts of snuff were imported and sold at $3 a lb. The trading shops sell port, sherry, claret, champagne, rum and cognac. They are expensive and of poor quality. The beer is used for commercial establishments. Brennivín, Korn-schnapps, or rye spirits are so cheap that there is no need to water them down unless you’re selling them to the peasants and adding a little water is a way the merchant can make a few extra cents. Apparently country merchants can sell 600 gallons of liquor a year. So, there you have it. You ride into Reykjavik with your trade goods to get a year’s supply of everything you need to survive the coming winter and you ride out with salt, lots of salt, enough grain, probably rye, to last the year, some wood planks if you’ve had a good year and can afford it, some bags of Rangoon rice and, if you’ve had a really good year, some spices to add to your daily diet of fish, skyr, rye bread and porridge. You probably have a bottle of brandy in your pocket and sway a little in the saddle as you take some fresh snuff out of your horn. There were more goods than that available, of course, but it will have to wait for tomorrow for a more detailed list of the items your great great grandmother hoped to buy when she arrived in Reykjavik.